INKA ARCHITECTURE, Less is More--Much More! The essence of Inka architecture cannot be distilled into a single word. Three themes demand recognition: precision, functionality, and austerity. 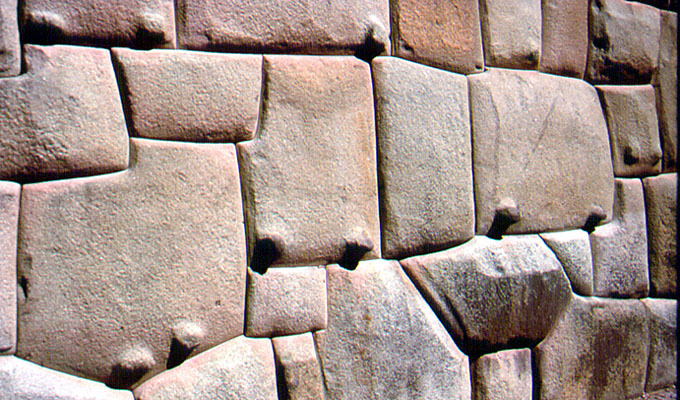 The Inka stonefitters worked stone with a precision unparalleled in human history; their architects clearly esteemed functionality above decoration; yet their constructions achieved breathtaking beauty through austerity of line and juxtaposition of masses. The Inka seem to have presaged Mies Van der Rohe's philosophy of "less is more". The dominant stylistic form in Inka architecture is a simple, but elegantly proportioned trapezoid, which serves the dual ends of functionality and severely restrained decoration. Trapezoidal doorways, windows, and wall niches are found in Inka constructions of all types, from the most finely wrought temples to crudely built walls in unimportant buildings. The doorways and windows are obviously functional, and the niches probably served a variety of functions as yet unidentified by the archeologists. Placement of these trapezoidal openings was primarily functional, but occasionally, esthetic arrangements might dominate the placement of the trapezoids, if there was no conflict with functionality. Perhaps the single field in which the Inka builders allowed fancy to supercede function is in their playful handling of flowing water. 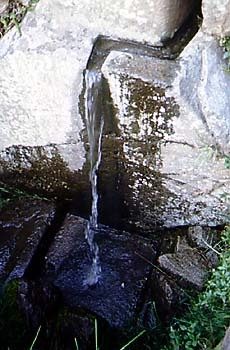 Sparkling streams cascade from stone spouts, sometimes decorated with carved designs, into joyfully splashing basins, then flow through quite unnecessarily complex stone channels to pour into the next fountain (or bath, as the fountains are sometimes referred to) and so on from fountain to fountain, one after the other. The Inkas employed the sight and sound of water as an element of architectural design and evidently enjoyed demonstrating their mastery over the course of this essential fluid. Various aspects of Inka architecture-- construction methods, design, and characteristic features-- will be illustrated in the following paragraphs, using photos taken in well-known archeological sites in the Cusco - Sacred Valley - Machu Picchu area. No special archeological or architectural expertise is claimed by the strictly amateur compiler of this webpage, just a respectful awe of the achievements of these superb Andean architects and engineers who left modern society these astounding monuments to enjoy and puzzle over. Let us start by looking at the working of the stone medium with which the Inkas built. They built with locally available rock, from limestone to granite. However, the "local" supply might be several kilometers distant and involve a transportation problem that would have daunted a less capable people. At Ollantaytambo, huge blocks were quarried from one side of the Urubamba Valley, shaped in part, and then brought down the mountainside, across the Urubamba River, and up a long construction ramp to the great fortress-temple complex above Ollantaytambo village. The fortress-temple of Ollantaytambo is famous for its beautifully fitted great slabs of red porphyry forming a portion of what must have been intended to be its principal temple. But this complex, a work in progress when the conquistadores arrived, was never finished. 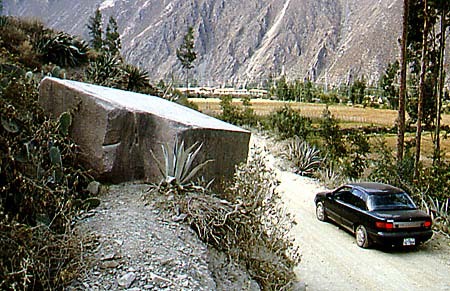 A number of large cut blocks were abandoned en route to the site and remain today, known as piedras cansadas or "tired stones". 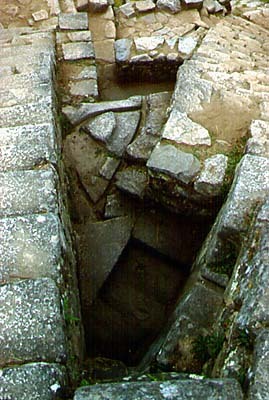 Within the complex, a stone that was in the process of being maneuvered into its final position can be seen lying on its emplacement ramp. 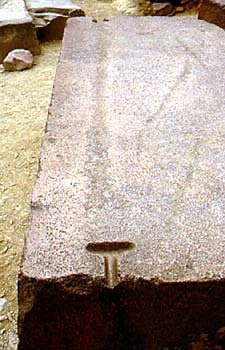 Other stones exhibit peculiar grooves which were meant to be filled with molten bronze or copper to lock two adjacent stones together (as was done by the Greeks in their temple construction, and also by the people of Tiwanaku near Lake Titikaka). How the Inka cut stone without iron tools is not known with any certainty, but in all likelihood stone was cut and shaped mainly with stone tools. Bronze or copper tools may also have been used, but would be of limited use with the hard varieties of igneous rock commonly used by the Inka. In Cusco can be seen an interesting stone that was evidently abandoned while being cut in two; the row of narrow holes forming the line along which it was to be split seem to bespeak the use of a metal tool. Probably this stone represents post-conquest work for the Spaniards. 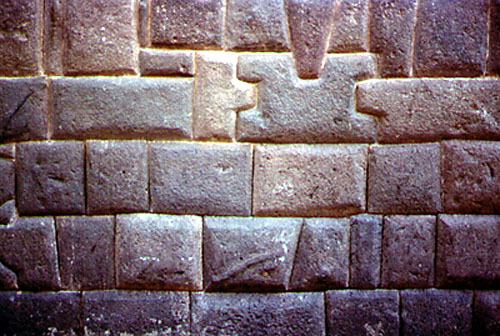 The conquistadores admired Inka stonework sufficiently to employ Inka stonecutters and techniques in colonial buildings, and many of the "ancient Inka" walls in Cusco belong to the colonial period, such as this wall with carved snakes and stones in non-Incaic shapes. It is assumed the Inkas knew the technique of splitting rock using wooden wedges placed in cracks, then soaked in water, until the expanding wood split the rock-- a method developed independently by many ancient societies. 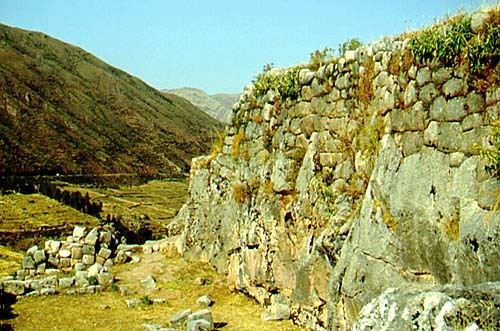 The quarries near Ollantaytambo were located in landslide talus, obviating the need to detach the stone from the living bedrock. In any case, once split from the bedrock, stones could be shaped by percussion using hammerstones. "Peck marks" or, more properly, percussion marks are obvious on much Inka stonework. Recent experiments have shown that stones can be shaped with remarkable precision by using a series of increasingly smaller hammerstones as the face is pounded into its final form. 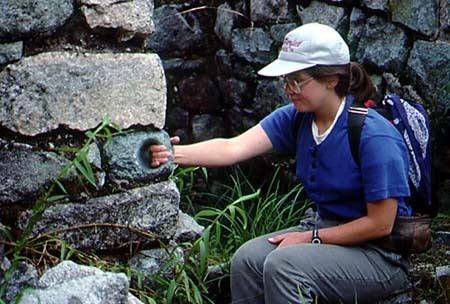 The Inkas could also drill holes through rock, such as in this ring of unknown function projecting from a wall in Machu Picchu. Holes were probably drilled using grit and some sort of pestle stone. 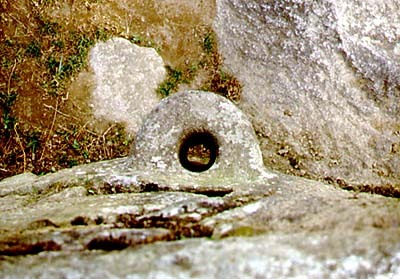 Holes drilled through rock are narrowest in the middle and flare outwards, as drilling with a pestle and grit would inevitably wallow out the first-drilled portions of the hole. But neither shaping stone into rectangular blocks nor drilling holes through hard rock constitute reasons for the fame of the Inkas as the champion stonecutters of human history. 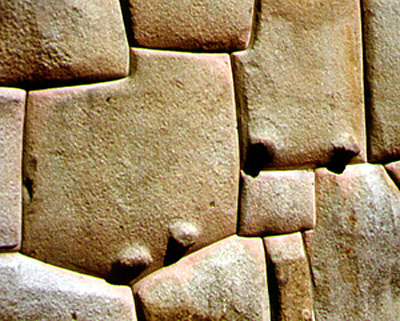 The glory of Inka stonecutting lies in their ability to cut unusual shapes and fit them tightly together, as exemplified by the famous "twelve-cornered stone" found in a wall of the palace of the Inka Roca. It is both a cliché and a verity that the stones are so closely fitted that a knife blade cannot be jammed between them. How did they achieve these amazing close tolerances? In 1987, architect Vincent R. Lee proposed that the Inkas used a technique known as scribing and coping to fit their wonderful jigsaw-puzzle stones. This technique is used to shape dove-tail joins of logs at the corners of log cabins, resulting in logs carefully fitted together with little or no gap between the cut log faces. A related technique could have been used by the Inkas to shape their stones. If the Inkas employed the scribing and coping method, the process might have been something like this. To keep the illustration simple, we'll start with a simple rectangular wall block that is to be set in a notch or seat carved in the underlying wall stones or bedrock. 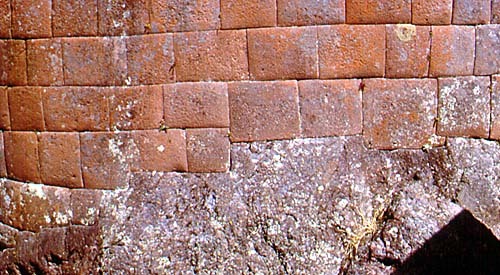 A good example of rectangular blocks set in bedrock notches can be seen in this foundation wall at Pisac. Our rectangular block has a bottom, top, and two ends that must be fitted to their bedrock seat and the neighboring stones in the wall. The front and back sides do not have to be shaped for any particular fit. First the bottom and two ends are cut to a rectangular shape. 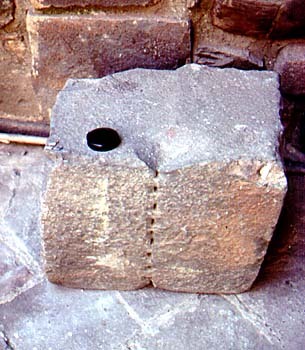 Next the seat and faces in the underlying stones must be cut to fit this block. To do this, the block must be suspended above the stone on which it is to be seated. For very heavy stones, this is not a trivial problem, but perhaps the stone could be propped up by logs leaning in diagonally from the front and back sides. Now, the cut outline of the suspended block is traced with a scribing device on the stone below, into which a seating surface will now be cut out, i.e., coped. The scribe could be a simple wooden triangular device, in which one point is moved along the finished cut in the upper stone, and another point shows where the stone surface below needs to be coped down to make the matching face or seat. To achieve this, the angular relationship between the upper stone and the lower stones must remain constant; this could be done through the use of a plumb bob strung through the triangular scribe. Here is another view of wall stones seated in carved-out notches, at Puca Pucara. 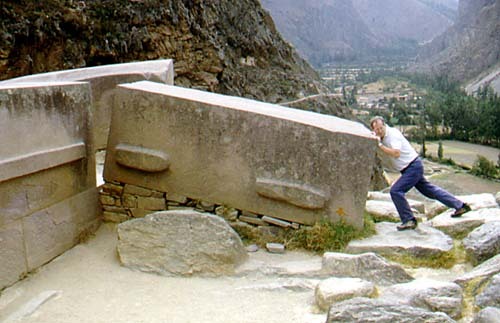 That the scribing and coping technique is a practical solution to the mystery of the Inka stoneshaping methods was demonstrated by modern stonecutters under the direction of Vincent Lee in the 1995 NOVA program "Inca". Whether or not it was the technique used by the Inka may never be known, but no other practical solution to the problem has been discovered. Whatever the method used, it was a lot of work, even for the Inkas with their great work force. As a result, a labor-saving device was commonly resorted to: in much of the stonework, only the load-bearing surfaces are closely fitted throughout the entire surfaces; vertical joins are commonly closely fitted only to depths of a few centimeters from the outer face, with any leftover space between the rest of the vertical joins being filled with sediment. What the Inkas must have considered their very finest stonework is found, naturally, in their most important buildings, their temples. Temple walls are battered (inwards sloping), and constructed of finely hewn ashlars laid in courses that get progressively thinner upwards. This creates a wall with a wonderfully stable and pleasing appearance, and which is, in fact, highly resistant to seismic shaking. 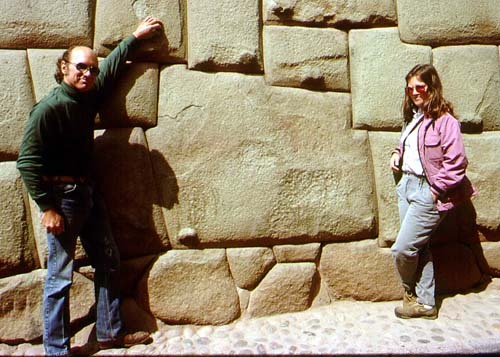 Earthquakes are a common building hazard in the Andean region, and Inka stonework has survived for centuries, even as Spanish colonial structures have collapsed. 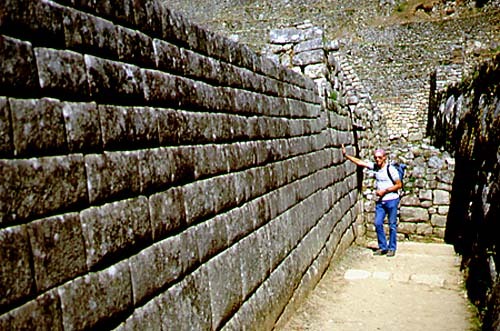 In fact, the most durable Spanish constructions have been those that incorporated Inka walls. 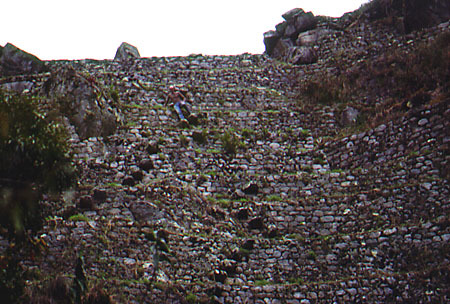 Here original Inka walls have been breached by Spanish colonial doorways; note the inward slope of the lower wall, as opposed to the vertical upper wall of European construction. 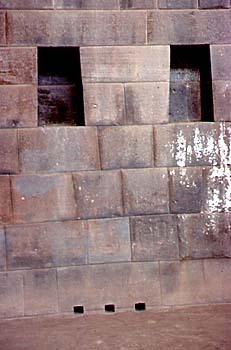 The inside face of these sloping walls is normally plumb, as seen here in the fine stonework inside the Coricancha, the Inka "holy of holies" in Cusco. Thus the walls were thicker at the base, where the more massive courses were laid, and somewhat thinner higher up where the courses were smaller. 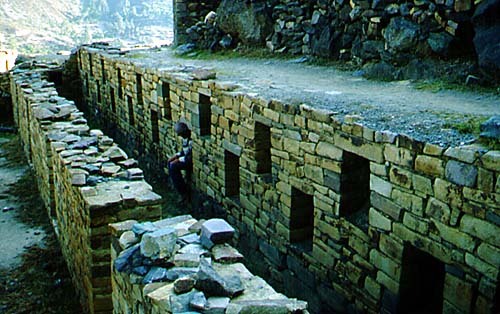 A different style of wall construction is seen in some of the palaces built for each Inka ruler-- the famed "cyclopean" walls of oddly shaped blocks cut like jigsaw puzzle pieces and fitted together to astounding precision with no mortar. Note the bosses on the stones in the previous picture; it is thought that these might mark where logs supported the heavy stones while the seat was coped into the underlying stones. 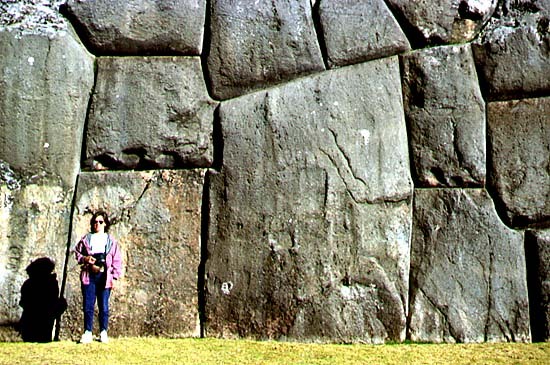 In the case of the Sacsayhuaman fortress above Cusco, cyclopean walls contain individual blocks estimated to weigh over 100 tons. Clearly there could be no repeated trial-and-error fitting of such monster stones; they had to get it right the first time. Numerous large stones in the fortress walls-- such as the stone above the model's head in the next photo-- feature notches which may indicate where the supporting logs were placed while the seat for the stone was coped into proper shape. 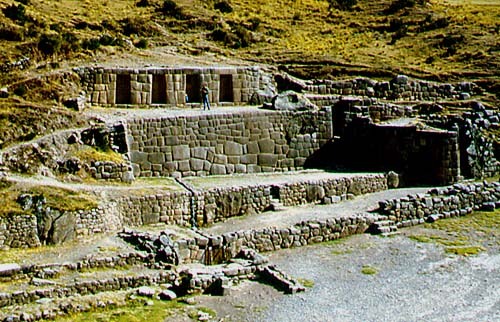 Of course, not all Inka buildings were built of fine stonework. Buildings of lesser importance might be constructed of rough stones set in mud, in a style known as pirca. 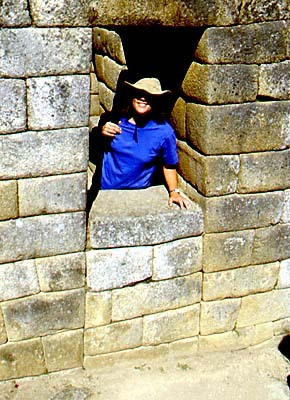 As mentioned earlier, Inka doorways, windows, and wall niches are trapezoidal. Some were simple, but elegant, trapezoidal openings. The finest doorways, called "double jamb doorways", have a recessed lip several inches wide inside the outer trapezoid. This inner lip was, in most cases, a design element that indicated an important doorway to a high status site. Such a jamb might also have facilitated the emplacement of a wooden door to close the opening. 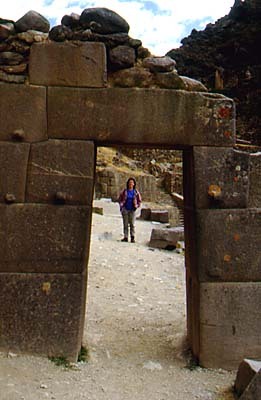 That doors were used to close some Inka doorways is indicated by a variety of carved stone devices apparently used to hold a door in place. Simple stone rings carved in both sides of doorways probably were used to tie a bar or other largely symbolic barrier in place, to indicate a closed area. 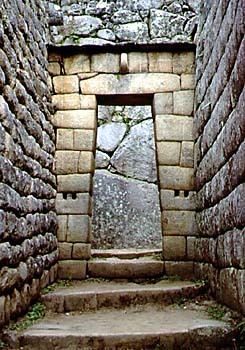 While no original wooden doors have survived the nearly five centuries since the collapse of the Inka empire, elaborate closure devices associated with numerous important entries and gateways appear to have been used to hold real doors in place. 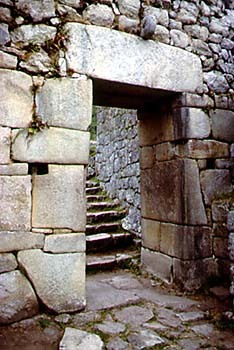 One of the best examples, featuring a stone loop above the doorway, and two barholds consisting of stone cylinders fixed in niches on either side, is the principal gateway at Machu Picchu. This portal opens through the main wall of the Royal Estate, and clearly was meant to have a defensive door that could be sealed in place with ropes, and braced, if need be, with heavy beams. The sides of trapezoidal windows might be built up with ashlars with one end cut to a gentle slant to conform with the trapezoid sides, and capped by a long stone for a lintel. 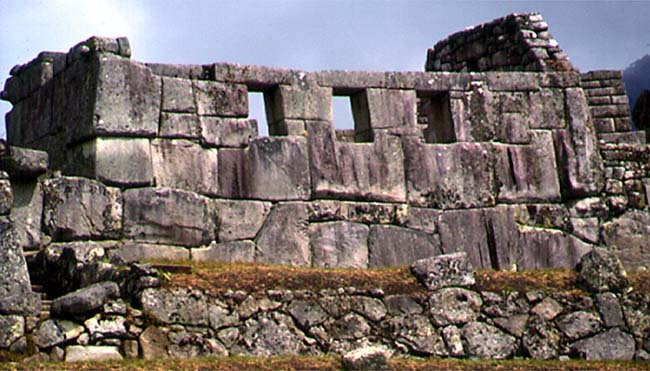 And they could be framed with specially shaped stones cut and fitted "cyclopean style", as in the case of the "Three-Windowed Temple" at Machu Picchu. 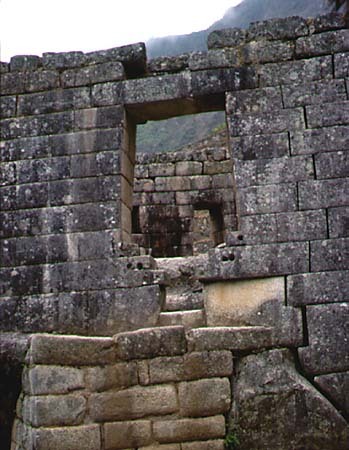 An unusual sight is the conversion of a trapezoidal doorway into a window, as seen near the Intihuatana at Machu Picchu. If you return to the image of the "Three Windowed Temple" (above), you can see that it too was modified in this manner, having originally had five windows. 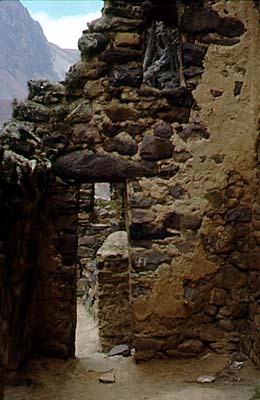 Equally interesting --almost startling-- is the modern use of the trapezoidal doorway at Ollantaytambo. 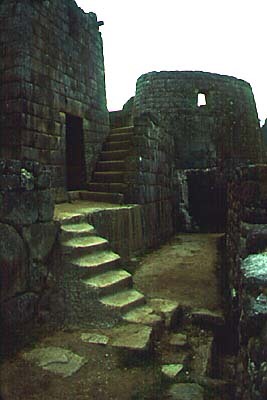 At Machu Picchu and other Inka sites, buildings open on one side, known as masmas or wayronas, are common. Lacking a wall on the open side, the roof had to be supported by a beam stout enough to run the length of the building (or to a supporting pillar in the center of the run). The notches in which the roof-supporting beam was set can be seen in the end walls of this masma. 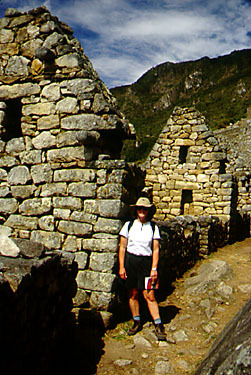 Most Inka buildings were rectangular, featuring steeply sloping gable walls at the narrow ends, which served to support the roofing. Roofs were thatched, over a framework of rafters and purlins running from a ridge pole at the apex, down to the stone eaves walls (or support beam in the case of masmas). Thatched roofs are common in Andean peasant dwellings today, and the chroniclers of the conquest left no doubt that thatch was employed by the Inkas on even their finest constructions. 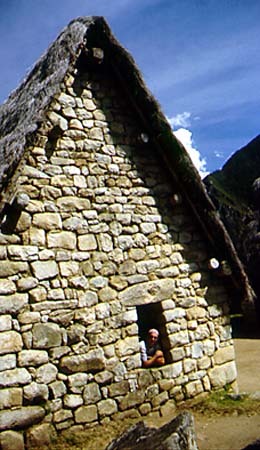 Naturally, none of the original pole and thatch roofing has survived the centuries at Machu Picchu, but a number of buildings have been "restored", with roofs constructed in much the same manner as sketched by Hiram Bingham, Machu Picchu's discoverer, in his hypothetical reconstructions of Inka roofing. In these modern restorations the roofing framework is lashed down to a series of tie-points built into the walls. However, Vincent Lee has argued persuasively that the roof-supporting framework was, in most cases, held down by its own weight, not by being lashed to any built-in attachment points. If Lee is correct, an alternative explanation is required for the stone pegs and rings that are obviously attachment points associated with roof construction in some way. 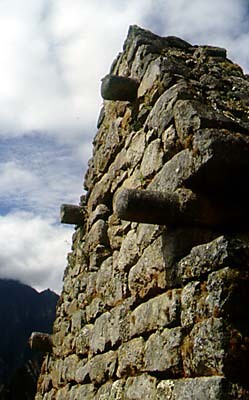 The most visually obvious type of attachment points are formed by stones carved with cylindrical bosses set into the gable walls to form a series of pegs near the roof line. Less obvious, because they are normally recessed flush with the sloping top of the gable walls, are stone tie rings, called "eye bonders" by Bingham. 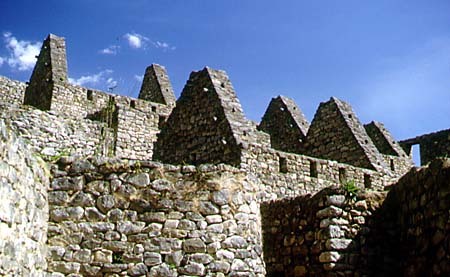 Lee has shown that it is mechanically both unnecessary and impractical to use these tie points to hold down the roof-supporting framework, except in particular Inka buildings situated where strong updrafts are a problem (and in these cases additional sets of pegs, recessed into the upper slopes of the gable walls and apparently specifically created for the roof framework, were incorporated into the design). According to Lee, the stone pegs are better explained as tie points for lashing down the thatch itself, rather than the supporting framework. The eye bonders are believed by Lee to have served to stretch tight a closely-woven ceiling mat underneath the thatch. Such a ceiling mat was reported in 1877 by archeologist-diplomat E. George Squier who described in detail the roofing construction of an ancient Inka building which, in his day, retained its roofing. The functional purpose of the ceiling mat would have been to keep out vermin; in addition, such mats may well have served esthetic purposes if woven with decorative patterns. 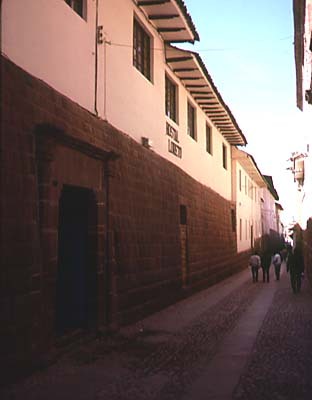 In Cusco, the Spanish chroniclers tell us the buildings were all flat roofed. Here also wooden beam and thatch construction was used, which proved a liability for the Spanish during Manco Inka's revolt against the conquistadores in 1536, as flaming arrows torched the roofs of the buildings in which the Spaniards were holed up. Considering the topography in which they built their cities, it would be astounding if the Inkas were not master stairway builders. 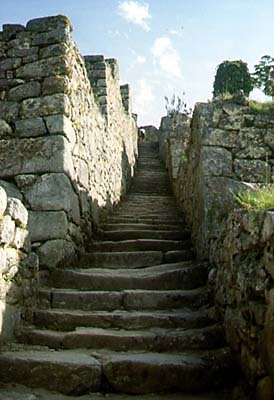 Wide stairs marked the main "streets" linking the various levels of their mountain towns, sometimes in long continuous flights made of elongate stones laid flat to form each step. In other instances each step consisted of a series of small stones, shaped and set in a row. And with surprising frequency, the Inka resorted to the more laborious mode of stairway making, hewing steps from the living bedrock. 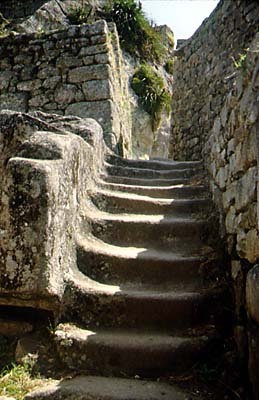 Perhaps the most perfect example of steps carved from bedrock are those leading up towards the "House of the Ñusta" at Machu Picchu: six steps, curving slightly utilizing a bedrock projection that otherwise would have been in the way. On the other hand, access to work areas, especially agricultural terraces, might be provided by narrow, steep steps or, more commonly, mere stepping stones projecting from the terrace retaining walls. As mentioned in the introduction, the Inkas regularly manipulated the flow of water through their building sites via canals and fountains. Though referred to by various authors as "baths" or "liturgical baths", most of the fountains were just that, designed primarily for the utilitarian, but essential, purpose of supplying potable water. 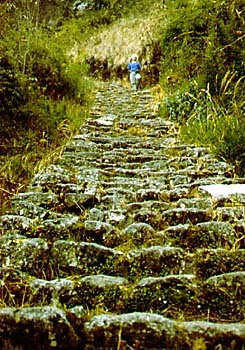 A few kilometers outside of Cusco is the archeological site of Tambomachay, popularly known as the "Bath of the Inka". This site consists of massive stone walls, at several levels, with elegant niches, and a series of water fountains cascading from channels hidden within the structure. The entire construction, or at least what remains today, apparently was for the fountains themselves. 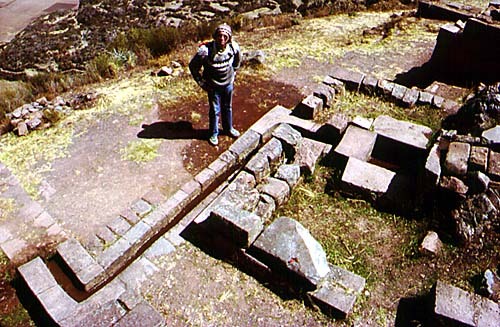 Water was brought through channels carved in the living stone, or through conduits constructed of carved and carefully fitted stones, such as those seen at Pisac. 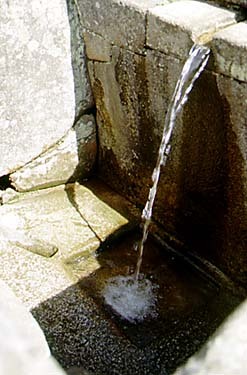 A water supply channel might feed a single fountain such as the Baño de la Ñusta in Ollantaytambo. And fountains or baths were also arranged in long series, such as at Phuyupatamarca, with six serial fountains; Machu Picchu, with 16 fountains, each different from the rest; and Wiñay Wayna, with a grand total of 18 fountains, mostly identical in construction. 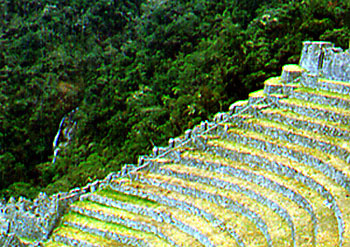 A portion of the Wiñay Wayna string of fountains can be seen at the far end of the terraces at this magnificent site. In close succession, one fountain feeds the next. 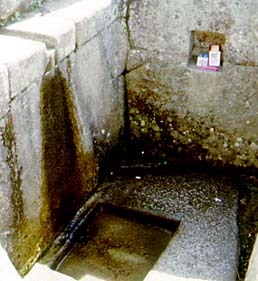 At Machu Picchu, the uppermost fountain is associated with important structures, and likely was truly a liturgical fountain or bath. Obviously the water quality would be best in the uppermost of the 16 fountains, and so it is assumed that this fountain served the more important residents of Machu Picchu. Moreover, one wall of this fountain enclosure features a small niche that an irreverent wag couldn't help but compare to a soap dish! Notwithstanding the obvious utilitarian value of a supply of running water to the residents of Machu Picchu, this amazing series of 16 fountains is also art, with totally unnecessary frills such as diverging and re-joining water channels. 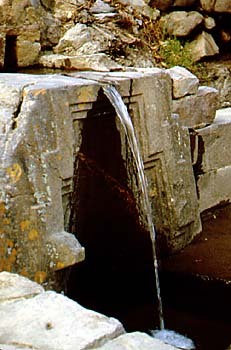 The Inka stoneworkers played with the water right on down to the lowermost fountain's zig-zag feed channel. Probably the most ambitious constructions undertaken by the Inkas, certainly in terms of volume of material moved, are the innumerable sets of agricultural terraces built on mountainsides and in river bottoms throughout the Inka empire. Known as andenes, terraces were formed with stone retaining walls, holding in a lower layer of coarse rubble (to ensure proper drainage), and an upper layer of good topsoil (which in some localities had to be carried long distances up the mountain from the valley below). 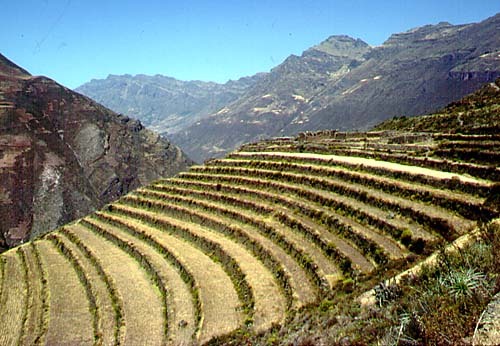 Spectacular terraces at Pisac are still cultivated today. The individual terraces are accessed by stepping stones tenoned into the terrace walls. 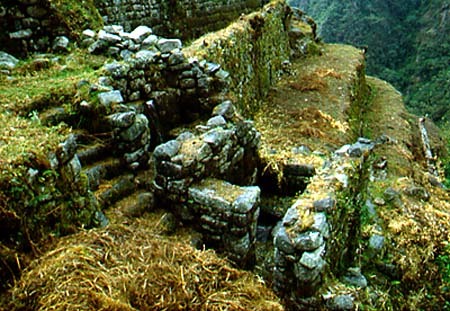 At Machu Picchu, the "agricultural sector", devoted to andenes makes up approximately half the site and likely could have produced more foodstuffs than required by the estimated 300 permanent inhabitants of the Royal Estate. Although quite capable of transforming steep mountainsides into agricultural lands, the Inkas naturally preferred the rich valley bottoms. Fertile valley bottomlands were terraced and riverbanks walled to protect these richest lands from erosion. 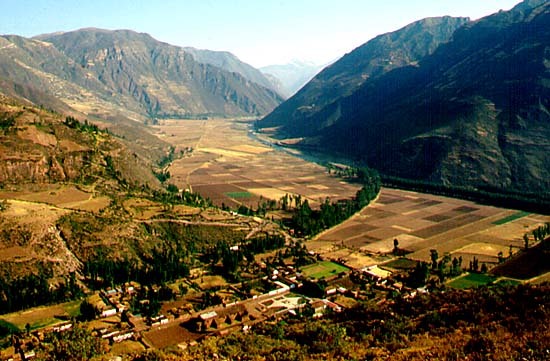 The Sacred Valley of the Urubamba River was under intense agricultural use in Inka times, as it is today. To protect choice agricultural land near Pisac, the Urubamba was canalized for at least 3.3 km, said to be the largest pre-Columbian canal project in the Americas. The Inka civilization has left the world, and Peruvians in particular, with an immense architectural legacy. Machu Picchu is certainly one of the most famous archeological sites in the world, and a visit there can be a mystic experience. Hiking still-intact portions of the vast Inka highway systems is a wonderful experience for outdoor adventurers. A tourist industry based on Inkaic works is important to modern Peru's economy. But the Inka legacy extends beyond mere tourist attractions. A remarkable portion of what they built is still in use: Inka walls still support the most important buildings in Cusco, surviving earthquakes that send more recent constructions toppling to the ground; 500-year old andenes still grow food for Peruvians. Studies of agricultural works-- Inka terraces, the camellones (raised agricultural beds in flood-irrigated lands) found in the Lake Titikaka area, and complex irrigation canals constructed by pre-Columbian cultures on the Peruvian coast-- may lead to improvements in modern land usage patterns and increased output of foodstuffs in Peru. These ancient works of lasting usefulness are sources of national pride to Peruvians, and perhaps someday will play a role in a renaissance of indigenous culture in Andean Peru. Would you like to see the magnificent works of the Inkas for yourself? 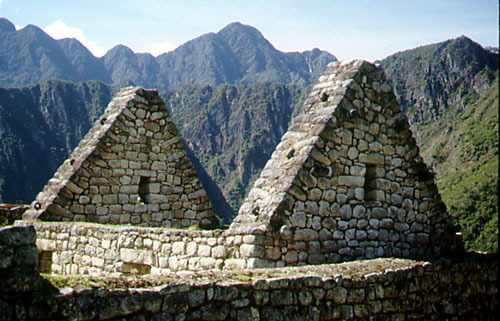 If so, click here: Inka Empire trips for independent travelers. Want to see the famous Inka Trail? Click here: Hiking the Inka Trail. To see exciting guided trips and other travel services offered by Rutahsa Adventures, visit our homepage: Rutahsa Adventures. Much information about Inka architecture was taken from "Monuments of the Incas" by John Hemmings and Edward Ranney (1982), a fine scholarly work beautifully illustrated. 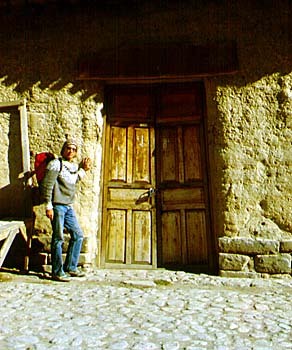 The author of this webpage is also indebted to Peter Frost's very excellent guide to the Cusco area, "Exploring Cusco". No visitor to the Cusco region should be without this fine guide, available in inexpensive paperback, and a terrific compendium of information, well presented. By far and away the best guidebook for Machu Picchu is "The Machu Picchu Guidebook -- A Self-Guided Tour" by Ruth M. Wright and Alfredo Valencia Zegarra (2001, 2004). This webpage has benefitted materially from information in this guidebook and a series of papers authored by Kenneth R. Wright. 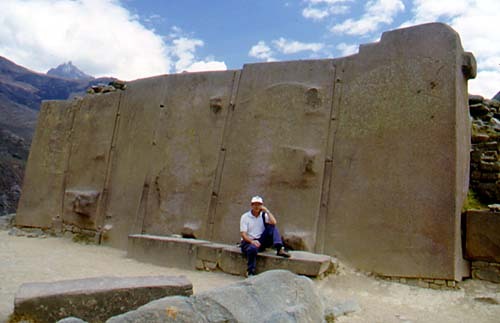 Vincent R. Lee's scribing and coping theory of stonecutting is presented in detail in his article "The Building of the Sacsayhuaman", which was published in 1990, vol. 24 of Nawpa Pacha, the journal of the Institute of Andean Studies. 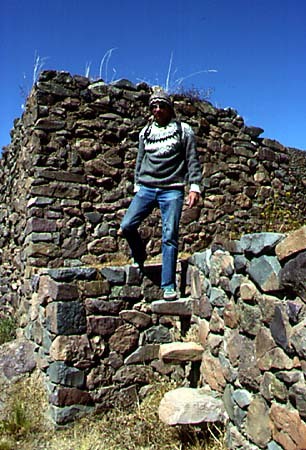 His theory on Inka roofing techniques is described in his paper "The Lost Half of Inca Architecture", presented in 1988 at the annual meeting of the Institute of Andean Studies. These articles, and related writings, are available in reprint form directly from Lee, who can be contacted through the WWW: search on "Sixpac Manco"! Ephraim George Squier's beautiful book, "PERU: Incidents of Travel and Exploration in the Land of the Incas" was published in 1877 by Harper & Brothers and is now a sought-after collector's item; even a modern facsimile edition is now scarce. This 599-page work, illustrated with abundant engravings, is a wonderful combination of pioneering archeological work and descriptions of the marvellous adventures inherent in 19th-century travel across the Andes. Return to beginning of page. Photos on this website by Janie and Ric Finch, @copyrighted.